Not a Gimmick! Finally the science of Hydrogen automotive power has been made a reality! 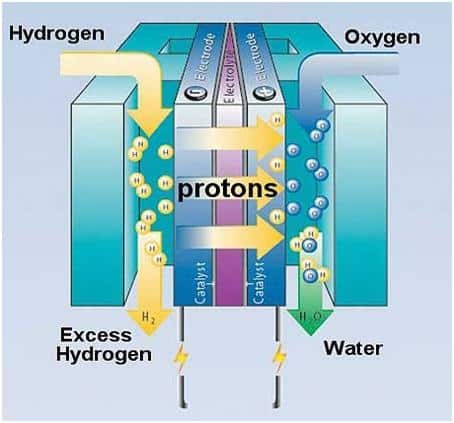 Technically a device that converts the energy stored in hydrogen into motion can be called a Hydrogen engine. Hydrogen would make a great fuel for the environment since burning Hydrogen produces nothing but water! Liquid hydrogen is stored in a tank at the rear of the car and is pumped forward to the fuel cell stack as and when required. When Hydrogen is combined with Oxygen in a fuel cell a chemical reaction creates electricity. The battery pack is periodically recharged by the fuel cell. The power from the battery pack is used to provide rapid acceleration. Right from the year 1625, when Johann Baptista van Helmont discovered the gas, Hydrogen; people were curious enough to find the uses of the new found gas. It nearly took a mind boggling 181 years to develop an internal combustion engine which runs on a mixture of hydrogen and water by the icon of 18th century who is none other than, Francois Issac de Rivaz. The Swiss inventor, is credited with the development and construction of the world’s first IC engine back in 1806. From then onwards, it was always a challenge to develop the best IC engine. This has lead to developing different varieties of engines. A pictorial representation of the Hydrogen powered vehicle is shown below. it is very nice project. I want to do this project. would please give an idea about this project. sir please mail me. SIR,idea ws fantastic but society mostly choose offerd safty….using of hydrogen may takes for explosion ………..plzz share me some more ideas and innovaties…..
sir, it is very nice concept pls tell me full details about project. This topic is very useful for future . I need relative information of This topic.plz give me some info. please send me details of this project to my email-id. this project successful in market if any body required derail. the information about the project is not sufficient so please provied the information for completing the project. the project, so please mail me regarding this..
PLs give me more information about that topic sir….. Pls mail me. …. I am really interested in doing this project.this is amazing…….please provide some more information regarding this project….and please mail it to me…. Hi sir this project is really very nice.sir I need the details of this project.hydrogen is biproduct how to separate these plz help us sir. Sir, its a good project ……… i want more details about this project………… Plz send me more information about project. it’s project is very impotant for running humanlife,,,so i intereted that i working this project at now….please give more information…..
Hi sir, its very interesting idea about d projects, but i havn”t get more information, so i kindly request to u plz give me information about dis projects sir. sir, pls. send me synopsis of this project. sir, please i want to know more about the project please do mail me detailed information to me . idea is superb…….but in action……..we are going to face some problems…..please sir, can u give information briefly through mail? I am really intrested in this project, I want to work on this project . so please send me complete details of this topic. i want do project on this topic…..please send me complete details of this topic….. I have much interest on this project..I wanna create many things by doing this projects..so pls pls provide more information regarding this project.